Spotted lanternfly is a new invasive species in NJ. Egg masses are brownish grey and generally laid on bark in early fall and appear like a smudge of mud. Adults are expected to start egg laying in August and continue through November or the first hard frost. SLF eggs overwinter and can be laid on multiple hard surfaces, including fence posts, trees, patio furniture, fruit bins, landscaping stones, railway cars, etc. Due to this they can be easily transported and represent a significant risk to SLF populations spreading. Vehicles, stones, agricultural equipment, and fruit bins coming from PA or VA should be inspected for egg masses beginning in August. Within state movement is also of concern to prevent new populations. If found, egg masses can be scraped into a plastic bag and frozen to limit spread and future impact of this pest. Many of our fruit and vegetable growers throughout the state have been battling with populations of brown marmorated stink bug. This invasive pest feeds on most fruiting vegetables, small fruits, and tree fruits and can cause significant economic losses. One of the reasons that BMSB is such a bad pest is that when it arrived in the US, it did so without its co-evolved natural enemies. Until now! The Samurai wasp (Trissolcus japonicus) arrived in the US independently and the first populations were found in NJ in 2016 by the Department of Agriculture. However, no populations had been found in agricultural crops, which made us uncertain about its impact. 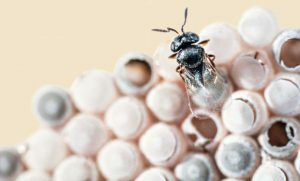 Last week, a parasitized egg mass was tentatively identified as the Samurai wasp. 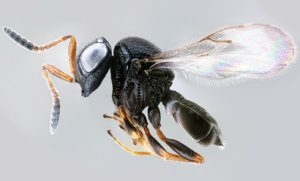 The Samurai wasp attacks stink bug eggs and has a special appetite for BMSB eggs. A female wasp will lay its eggs into the stink bug eggs. It is an effective parasite of BMSB and can parasitize on average 50% of each egg mass. 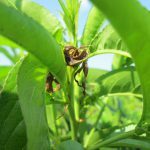 Our finding was in a commercial peach orchard in southern New Jersey and may be the first finding in a US agricultural crop. We had placed egg masses in the orchard to measure natural enemy impacts of our border spray approach. We do not know the impact the Samurai wasp will have in NJ agriculture but this is a very promising new development in the fight against BMSB. Reduced spray methods, such as border sprays, may help to protect Samurai wasp populations in crops. Drs. Joe Kaser and Clement Akotsen-Mensah contributed to this article. Have you seen this Insect? 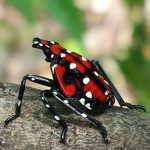 Some people may think it is a moth but it’s really a plant hopper known as the spotted lanternfly, Lycorma deliculata (White) and is a member of the order Hemiptera, family Fulgoridae. Its normal distribution is in eastern Asia, China, India, and Vietnam and has been found in Japan and South Korea. The adults are large (~1” long) and quite colorful with a black head, grayish black spotted forewings and reddish black spotted hind wings. Young juveniles are black with white spots and as they get older they become red and black with white spots. Spotted lanterfly nymph. Nymphs are black with red markings and white dots. Do not confuse them with BMSB nymphs which do not have spots and have white banding on the antennae. 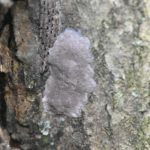 Egg masses are brownish grey and generally laid on bark in early fall and appear like a smudge of mud. Egg masses are 1-1.5” long and ½ – ¾ “ wide and survive the winter. This insect was accidentally introduced into Pennsylvania and was confirmed in the state September of 2014. At first it was also found in Berks County, however, today it has been collected from Lehigh, Northampton, Bucks, Montgomery, and Chester County. Cities in these counties where Spotted Lanternfly has been found are currently under quarantine meaning that live Spotted Lanternfly and any material or object that can spread the insect cannot be moved from the quarantine area. Inspection of shipments for egg masses and subsequent removal may be an effective management tool if it becomes established in New Jersey. The Pennsylvania Department of Agriculture has a video series on egg mass scraping. 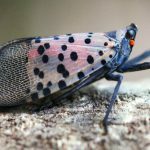 The spotted lanternfly is known to feed on more than 70 plant species including cultivated grapes, fruit trees, and hardwood trees. 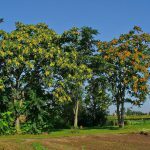 One tree of particular importance is Ailatus altissima (P. Mill) or the “Tree of Heaven”. Tree of Heaven typically grows in sunny areas along highways or disturbed habitat in clumps such as along farm edges. 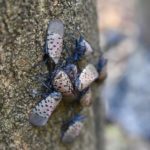 The Spotted Lanternfly must feed on Tree of Heaven to survive. Spotted Lanternfly has a sucking mouthpart and produces significant amounts of excess sugar from the plant sap, known as “honey dew”, during feeding. Honeydew can block sunlight absorption and reduce plant growth. We are concerned about this insect becoming established in New Jersey grape vineyards. In grapes, the honeydew produced during feeding is difficult to wash off and can reduce grape quality and perhaps growth. A 2015 and 2016 of 9 vineyards within southern New Jersey by the fruit entomology lab did not observe any spotted lanternfly adults or nymphs. However, in Pennsylvania, adults and nymphs were found in commercial vineyards in 2016 in Chardonnay, Concord, and Niagara plantings, although populations were low. Vineyard rows neighboring forested edges are at highest risk. If you think you seen or collected a spotted lanternfly please report it the New Jersey Department of Agriculture and the Department of Entomology at the Rutgers University School of Environmental and Biological Sciences by emailing slanternfly@njaes.rutgers.edu. This post was written by Anne L Nielsen and George C. Hamilton from the Department of Entomology. After the critically cold temperatures in early April followed by several other nights of below freezing temperatures, NJ peach and apple growers have experienced loss of blossoms and/or fruit set. While the extent of the injury may still be too early to tell for some varieties, the cold weather has not stopped insect pests and where no fruit will be harvested we need to adjust our approach to insect management. This provides an opportunity to use selective materials where possible and allow natural enemy populations to attack some key pests. Grape berry moth is one of the key direct pests of grapes in NJ. Females lay their eggs on the berry and the larvae makes a small entry hole and then feeds inside the berry. Webbing may be observed as the larvae move between berries. A threshold of 10% webbing has been used in NY grapes.The MSU model predicted degree-day timing for Intrepid or Altacor applications against grape berry moth to be last Thursday in South Jersey (Bridgeton). Due to the storm and the rains last week, applications may have reduced efficacy or were not able to be applied. If you have a history of grape berry moth pressure, today would be the tail end of timing for conventional materials. These include pyrethroids, like Bifenture or Danitol, or Imidan. Please read the label carefully as Imidan has a long re-entry interval. Also as a reminder, phytoxocitiy has been observed with using “EC” formulations of insecticides, such as Danitol, with Captan.